Whether you work in an office or from home, your surroundings can have a large impact on your productivity and general wellbeing. If you feel uninspired and uncomfortable throughout the day, consider revamping your home office with these simple improvements. Harsh lighting can cause glare on electronics which may lead to headaches and worsened eyesight over time. To reduce putting extra strain on your eyes, direct light away from your line of sight, and position your monitor so that windows are not directly in front or behind it. If you have a lot of paperwork, get a desk lamp that will shine down on it. Sitting at a desk for long periods of time can increase your risk of diabetes, heart disease, and weight gain. Investing in an adjustable desk will decrease these risks by allowing you to switch between sitting and standing throughout the day. In addition, standing desks can reduce back pain by adjusting to your ideal height which eliminates the need for hunching over as you work. Implementing an accent wall is a simple way to change the entire look of your office. To add depth and interest to your space, we suggest hanging patterned wall-paper. If you’re looking for something more versatile, painting one wall of your room with chalkboard paint allows you to jot down notes or unleash your creative side. Not ready to paint an entire wall? A transparent dry erase board will give you the same benefits of chalkboard paint without the commitment. Shelves are useful for decluttering your desk and adding more storage space to your home office. If you have a lot of books, consider constructing a studious-looking wall of shelves. If you just need a little more counter space, we suggest mounting a couple of shelves to the wall above your desk. Your work-chair is the heart of your office space. Investing in a quality office chair can have a huge impact on your work efficiency throughout the day. For optimal comfort, we suggest purchasing a chair with adjustable armrests, seat height, and lumbar support. Before buying your chair, always test it out, and consider getting one with a long warranty so you can exchange it if you start experiencing pain. 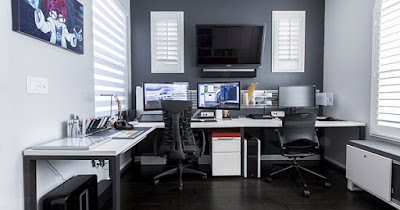 With these tips for revamping your home office space, you’re sure to experience increased comfort and productivity while you work.